Nowadays, increasing users use Viber as the first choice to keep in touch with colleagues and friends. And Viber data may allocate much space on iPhone and probably your storage space is shrinking. Does it occur to you that you have to delete Viber chat history, including audio, videos and pictures messages, in order to save space on your iPhone/iPad/iPod touch? Or you have to save your iPhone Viber messages to your computer before you restore your iPhone? Well, to back up Viber messages on iPhone before any deletion is necessary. Here we recommend three ways on how to backup/save iPhone Viber messages to PC before you restore your iPhone or delete them to save space. Viber offers users the method to make Viber backup on iPhone via email by using its own simple steps shown below. Step 1: Open Viber app on your iPhone. Step 2: Select More options to get the Viber system setting. Step 3: Select on Settings on your iPhone. 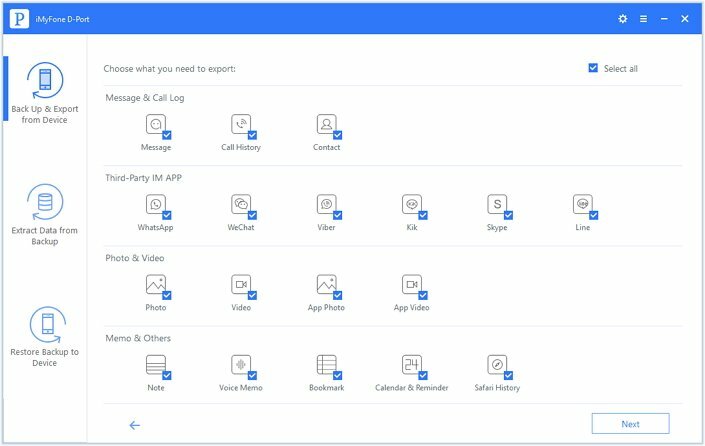 Step 4: Choose Calls and Messages and select Email Message History. Step 5: The app will zip your Viber messages automatically and you can send it to yourself or any other email. The main disadvantage of this method is that the backup file doesn't include the pictures or videos that are attached in your conversions. This method can only back up textual chat history on Viber. You can choose another method in case you require an alternative, here you can back up all your Viber messages to iTunes on your computer by simply following the steps. Step 2: Select your device i.e. iPhone in iTunes and you will see the Summary option. Step 3: Now you can click on the Back Up Now and your iPhone with Viber messages will be backed up. Step 4: As soon as your process ends just see if your backup finished successfully in iTunes preferences> Devices. The main disadvantage of this method is that you cannot read the specific contents in the backup and you will have to restore whole backup onto your iPhone for checking your Viber messages. To overcome these disadvantages of both the two methods, here we offer the third way to users. Here, the question that comes to your mind is how users could back up Viber chat history completely with messages, pictures, audio, and videos sent and received, and how they could view them whenever and wherever possible. Well then iMyFone D-Port iPhone Data Backup Tool is the best solution that we offer to users. The program works very well in exporting data from iOS devices and extracting Viber chat history from iTunes/iCloud Backups with user-friendly features. 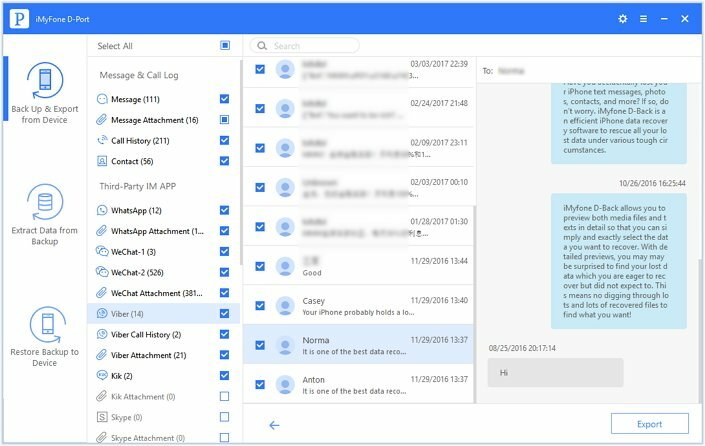 With this tool, you can backup or save your iPhone Viber messages to PC completely or selectively. Back up not only Viber messages, but also attachments (photos/videos) in chats. Back up 18 types of files from iPhone/iPad/iPod touch running the latest iOS 11 and earlier iOS versions. 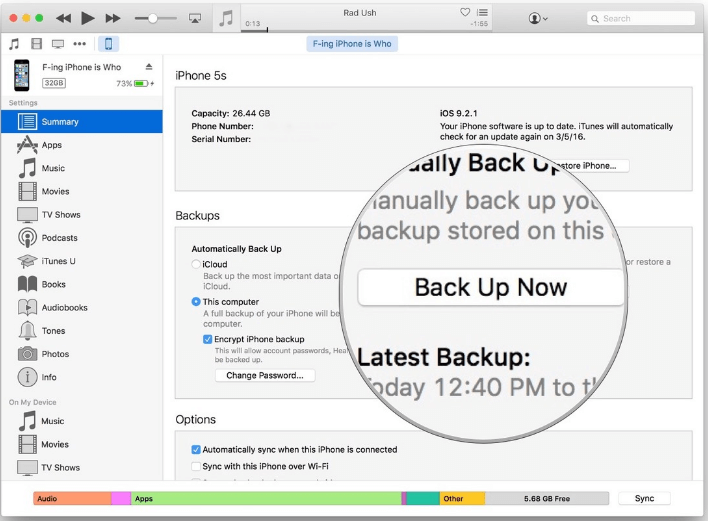 View and access data, including Viber, in iTunes/iCloud backup with easy steps. You can enjoy 30-day money back guarantee offered by the reliable iMyFone company. Step 1: Run the program on your computer. Make sure that your iPhone detected by this program. From "Back Up & Export from Device", tap on "Export Data" and click Next. Step 2: Choose Viber here from the 18 types of data. Now click Next to start scan. 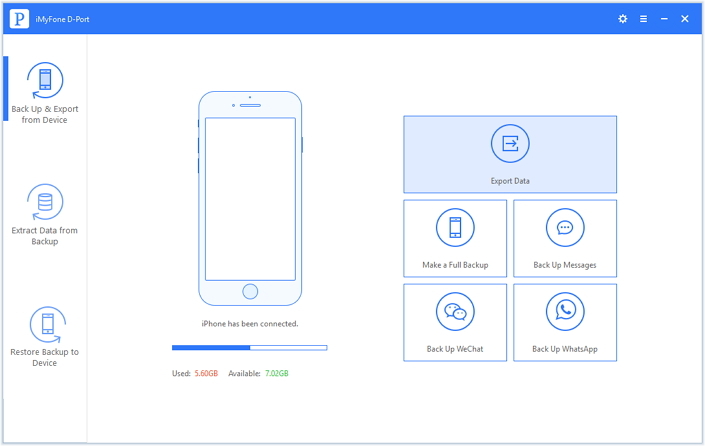 Now, how to back up/transfer Viber messages from iPhone to your computer, even an iPhone running iOS 11, won't be a problem anymore and you can use the free trial version of iMyFone D-Port iPhone data backup Tool which is offered in iMyFone D-Port's official page to confirm whether the tool is what you need.